NEXTPittsburgh(October 12, 2017) The Hootenanny starts in the pasture. Specifically, it starts in the patchy grass on India Loevner’s farm: an idyllic, 130-acre reserve populated by Loevner and her husband, at least one horse, and — as of a chilly morning in late September — 138 goats, which graze in herds on a field that’s just barely turning brown. This is Goat Rodeo Farm & Dairy, part of a growing community of cheese makers, mongers and lovers adding to a food scene that, until recently, wasn’t exactly known for its curdled milk. And next summer, the conference is coming to Pittsburgh for the first time. It’s not just the locally-made cheese scene that’s growing. There’s a movement towards connoisseurship in Pittsburgh, and the revolution has been a long time coming. For years, high-end curds like Loevner’s mostly eluded our meat-and-potatoes city, despite the fact that Pennsylvania ranks fifth in U.S. dairy production and seventh in cheese production. While small creameries put places like New Orleans and San Francisco on the fromage world’s map, Pittsburghers who craved more than processed, pre-packaged cheeses had to place orders through the city’s few wholesalers. Chefs hoping to showcase “local cheese” sometimes stretched the definition, trekking to Bedford, Blair and counties further afield to find small-batch favorites. But when food writers of the future wander the Steel City’s streets, marveling at its cheese shops and cheese restaurants and cheese events, and wondering how they got so lucky, they’ll look back with gratitude at 2017 — the year Pittsburgh solidified its status as a cheese town. It started in January with the opening of Casellula @ Alphabet City, a cheese-centric restaurant that sources its menu from around the world. In June, Wheel & Wedge — a fixture of the now-defunct Pittsburgh Public Market — opened a permanent retail space in Lawrenceville, hawking American-made cheeses for a growing base of consumers. Small creameries like Goat Rodeo churned out tens of thousands of pounds of cheese, aided by flavors from local businesses like Roundabout Brewery and Commonplace Coffee. And all the while, stores like Penn Mac and the East End Food Co-op continued to expand their selections. Good cheese, these days, is everywhere. Alix Hoylman, owner of Wheel & Wedge, opened a retail location in Lawrenceville this year. Photo courtesy of Alix Hoylman. To be held July 25-28 at the David L. Lawrence Convention Center, the Society’s conference, “Forged in Cheese,” will kick off with a competition and conclude with a cheese festival, which is open to the public. The Society will also roll out its Technical, Aesthetic, Sensory, Tasting Evaluation (T.A.S.T.E.) Test — a new exam designed to measure cheese professionals’ ability to evaluate and detect flaws in different types of cheese. The Society plans to pilot the exam in Pittsburgh. With so much on the horizon, there’s never been a better time to love (or make, or sell) cheese in Pittsburgh. But for small operations like Goat Rodeo, success is never guaranteed. In June, the Loevner family received a letter from the Duquesne Light Company proposing, by way of eminent domain, that the company run a high-voltage power line through the creamery’s goat pasture. They’re not alone. 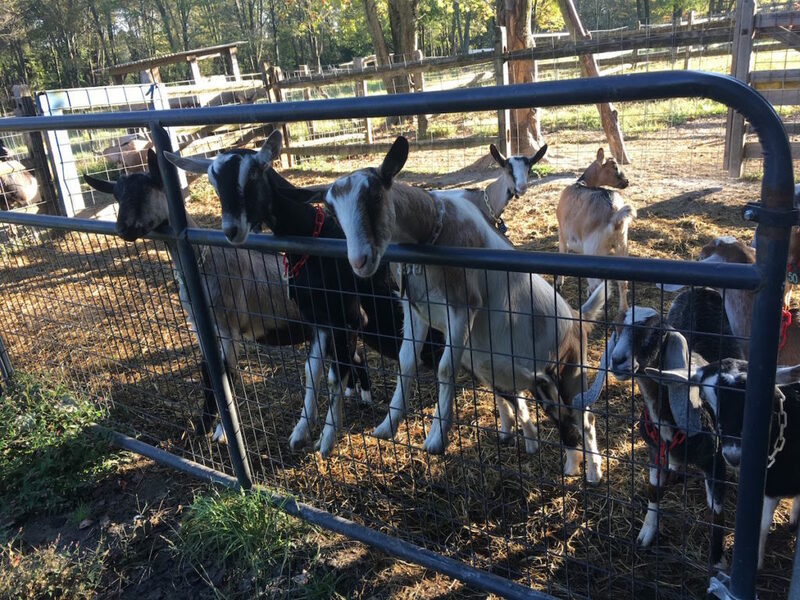 More than 2,000 people have signed an online petition demanding that Duquesne Light choose an alternative route, and Pittsburgh’s cheese community is coming together on Goat Rodeo’s behalf. On November 14, owner Brian Keyser of Casellula will join Kevin Sousa at Superior Motors to host a four-course awareness dinner. “Each course will be preceded by a sample of Goat Rodeo cheese,” says Loevner, “and then the course that follows will incorporate the cheese in a preparation.” The event aims to teach diners about efforts to protect Indiana Township’s Agricultural Zone, where Loevner’s goats turn grass into Chèvre, Chickabiddy, Hootenanny and more. Maybe it’s fitting that Pittsburgh has fallen for cheese. Like the food itself, it’s old but hip in its timelessness. It’s prone to flaws but unique to the world. Its smell, at times, can overpower. And yet the people who love it do what they can to preserve and share it, whether by signing petitions, hosting a dinner or opening a shop. They shape and define it like a well-made rind, protecting it for tomorrow’s enjoyment. And then they hope for the best. As Loevner shows me her farm, we stop outside her cheesemaking room, where nearly a dozen red, white and blue ribbons mark the creamery’s awards. Not bad for a two-and-half-year-old operation, I say.